Decals are images or logos that are projected on to your model. They could be something like a bar code, warning label or logo. One basic example of decals is shown here, representing a warning label and some basic instructions for use. Decals aren’t features that are machined in the physical object, but rather labels or stickers that are stuck on to the object before it is shipped to the customer. Typically, decals aren’t used in a model until the end of the design process. Sometimes it’s important for them to be included in the Bills of Materials (BOMs), while other times it’s important for them to be included to make the design look complete. Decals can also be used to help visualize a machined feature in a model. Instead of going through the effort of modeling complicated and time-consuming features, sometimes a visual representation is all that’s needed to get the job done. For example, the grill in the car below has not been physically modeled in SOLIDWORKS, but rather it was digitally applied using a decal. This works great because for renderings and animations the car looks complete even though the time-consuming step of modeling the grill was skipped. Working with decals in SOLIDWORKS is super simple. To get started you access the Decals Tab through the Appearances Tab of the task pane. From there you can browse through the library of decals or upload your own custom image to apply. Through a simple drag and drop you can place the decal on the model. Then it’s just a matter of resizing and rotating it to get it looking just right. Decals are extremely simple when you have the perfect transparent image ready to be placed on your model. But this can get a little more difficult if you’re working with a nontransparent image. Luckily there are some powerful tools available, like masks. 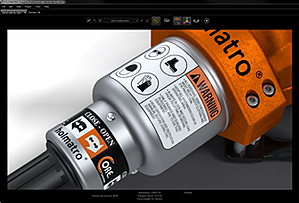 Right inside SOLIDWORKS, you can use an image file, selective color or even alpha channel as a decal mask. The tools are extremely discoverable once you know where to look for them. Sometimes the most difficult part is knowing where to look for them. When it comes to decals, all the properties and features you need are in the Display Manager tab of the Feature Manager. Once you’re there, you’ll be able to easily add decals to your models to help you complete your designs, taking your designs from good to great, because decals make the difference. Ready to take your design skills to the next level? Check out our upcoming SOLIDWORKS training classes and register.